Highly disturbing information about Republican Riverside County Supervisor Jeff Stone and his ties to organized crime is provided at the URL offered. Riverside County in Southern California has a history of having once been heavily influenced by the Gambino Mafia which resulted in the U. S. Marshall's Office coming in and cleaning up, removing the extensive Gambino infrastructure. 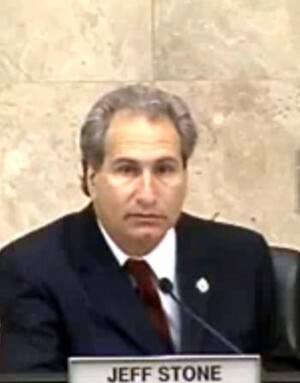 Unfortunately, Riverside County Supervisor Jeff Stone has been repeatedly caught on camera collaborating with the notorious Scientology crime syndicate, and now Jeff Stone is attempting to acquire higher public office. This is greatly disturbing. For all the reasons covered in the article referenced above and below, but also because Mr. Stone has repeatedly expressed complete contempt for the endless mainstream newspaper reports of his activities, and for the endless civil in-camera exposures of his racketeering against the citizens of California. Because of the wide coverage of his financial shenanigans and his unrepentant ties to organized crime, it's unlikely that this scumbag will manage to escape further exposure in his bid for higher public office however there remains a chance that with enough mobster money, he could buy his way in to a seat, a seat from which he would certainly continue to work for his organized crime associates against America's interests. My opinions only and only my opinions, as always. The opinions expressed in the article referenced by URL are those of the author or authors which wrote them.